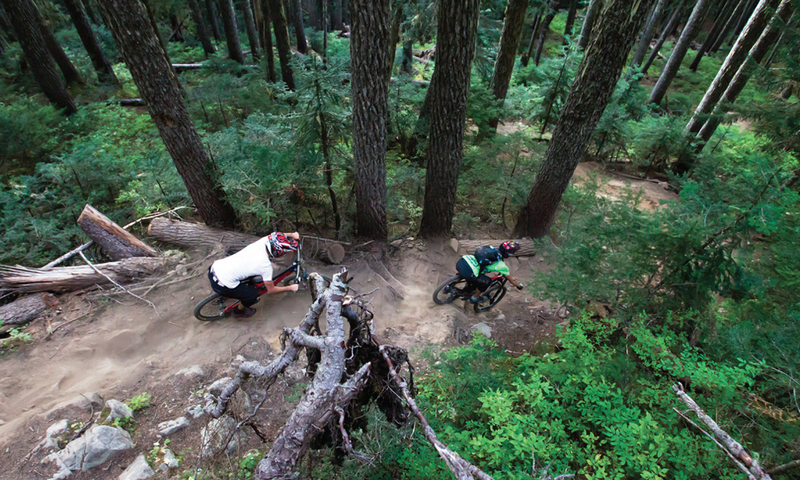 Whistler is a town brimming with recreational rites of passage — and the Whistler Mountain Bike Park has several of its own initiation features to graduate riders from advanced enthusiasts to bona fide Whistler shredders. The committing step up onto the Freight Train containers or the balls-dropping roll into Drop-In Clinic can quickly separate the field, as can old-school roller coaster, Joyride. For years, Ride Don’t Slide has been heralded as the bike park boundary trail separating the sheep from the goats. Originally built in 1980s by trials dirt bikers revving up the south side of Whistler Mountain, the steep and eroded fall line sections eventually had downhill biking initiates hanging onto their brakes for dear life, only to erupt in hoots and hollers as they flowed into the next corner. As the Bike Park lifts reached higher up Whistler Mountain and manufacturers built bikes with more brawn, time (and increased usage) was not kind to Ride Don’t Slide. 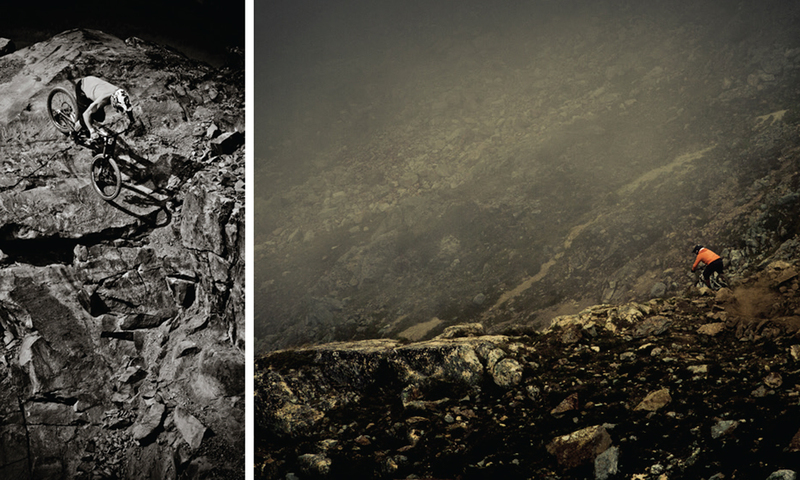 However, once Top of the World trail opened in 2010, Whistler’s Peak Chair began uploading mountain bikes into the high alpine and accessing Ride Don’t Slide no longer required a 20 to 30-minute uphill push from the Garbanzo Zone. As traffic inevitably increased, Whistler Blackcomb chose to invest resources into upgrading the popular out-of-bounds south side route rather than block it with deadfall or leave it in a state of purgatory. Finestone has more than enough on his plate keeping the 72 trails of the Bike Park maintained, so Whistler Blackcomb (WB) contracted local trail building think tank, Gravity Logic (whose founding members are responsible for most of the early Bike Park trail designs), to overhaul several sections of Ride Don’t Slide. In keeping with contemporary trail design and sustainable practices, the upper section of the trail now follows the contours of the landscape and allows ample drainage to avoid damage from the frequent rainstorms experienced on the West Coast. In keeping with contemporary trail design and sustainable practices, the upper section of the trail now follows the contours of the landscape and allows ample drainage to avoid damage from the frequent rainstorms experienced on the West Coast. On top of enabling Ride Don’t Slide to stand up to the abuse of long-travel downhill bikes, the investment is also aimed at making the trail accessible to more users by building alternate options to the burly rock faces that Ride Don’t Slide is notorious for. The link-up of Ride Don’t Slide with Top of the World in the Peak Zone and BC Trail in Creekside give mountain bikers their very own lift-accessed “Peak to Creek” run that starts with a panoramic alpine vista and finishes at Dusty’s. Now that sounds like a pretty sweet rite of passage. Note: Ride Don’t Slide is not within the Whistler Mountain Bike Park boundary, and as such is not patrolled. Always ride with a friend and carry sufficient tools for basic repairs on the trail. Jacob Coleman started riding in the Whistler Mountain Bike Park’s DFX Club at age five. Four years later, in 2014, he found himself atop the first ever Crankworx Kidsworx Downhill podium, a champion in the 7–9 Mixed Division category of a race that saw over 100 kids testing their grit on the bike park’s famous B-Line trail. 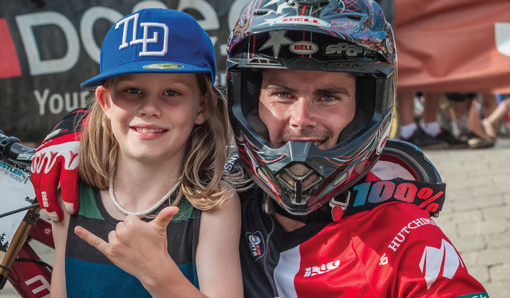 “It made him the first local supergrom to pull a Crankworx Kidsworx gold medal,” says father Jason Coleman, adding that finding and winning a Downhill race in his age category had been one of Jacob’s goals almost since he first started riding in DFX Club. DFX stands for Downhill, Freeride and X-Country and it’s an in-demand summer camp with coaching in all aspects of mountain biking. They now accept four-year-olds who can send it, and in 2014 added a Phat Kidz race series to give Whistler youth a feel for the DH competition circuit. That Crankworx added the Kidsworx DH race (the only one in Canada) that same year worked out just as well for Jacob and his fellow DFXers. While 13 seems decades away for ten-year-old Jacob, he says he hopes for an invite to the 2015 Crankworx Whistler Fox Air DH Kidsworx event (10 to 13-year-old division) for a chance to rip the same trails as legendary riders Stevie Smith and Brandon Semenuk. While he waits, he’ll be shredding park laps all season long. For DFX program info hit up whistlerblackcomb.com/bike and check out c4race.com for C4 Rider Training.